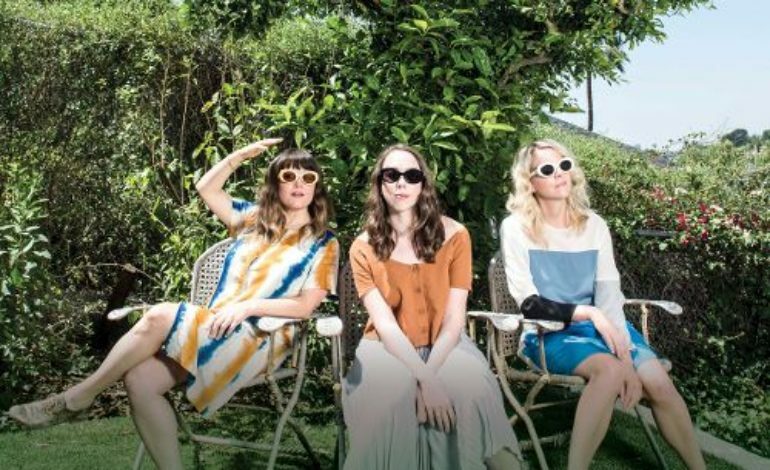 I’m With Her, composed of Sara Watkins, Aoife O’Donovan and Sarah Jarosz, has finally released their debut album and someone needs to write a thank you card to the magical Vermont Airbnb that fostered the creation of this modern acoustic folk masterpiece. See You Around does a remarkable job at highlighting the skill of these individually talented bluegrass musicians, while simultaneously creating a unified sound that seamlessly blends track by track together with two and three-part harmonies. Radiating from the graceful collection of twelve songs is a restless energy that perseveres through grueling heartbreak in order to move on to the wonderful and carefree side of life after love. The title track, “See You Around,” beautifully ushers in the album as it contrasts its light melody with dark lyrics describing the agonizing and relentless feeling of heartbreak. “Will it ever beat again? / Or just go on bleeding ‘til it’s empty / ‘Til I fill it up again,” sings Jarosz in honest sincerity. The next track, “Game to Lose,” has a catchy and competitive edge to it as O’Donovan goes solo on each chorus and quick three-part harmonies build the tune throughout. The song touches on the frustration of a journey that never quite seems to reach a destination. The next track, “Ain’t that Fine,” led by Watkins and a subtle dobro guitar, is an effortlessly delicate melody that accepts the mistakes of yesterday in order to embrace a more peaceful tomorrow. “Pangea,” on the other hand, creates a feeling of permanent loneliness with haunting vocals, a subtle electric guitar and lyrics like, “It’s a lonely life / Everybody lives, everybody lies.” Followed by that downer is the folky groove, “I-89” that you’re going to want to turn way up on your next road trip. The angelic trio sings, “Everybody wants a piece of me, everybody wants to see what I see.” Cue the entire world nodding… yes we do. The ethereal but cautionary track “Wild One,” is followed by the instrumental track, “Waitsfield,” which initially seems a bit out of place until listened to in full. The tune is just playful enough with its jaunty tempo to make sense for this group and once it gets started, it might even get a virgin two-stepper on the dance floor. The fun continues with, “Ryland (Under the Apple Tree),” a carefree and breezy tune that honestly just makes you want to lay in a hammock with the love of your life. The next few tracks, “Overland” and “Crescent City” inspire a spirit of independence, growth and movement. Watkins leads in “Overland” initially, but by the end, the powerful echoing chorus finds all three women in harmony as they sing “Goodbye brother, hello railroad.” I’m With Her masterfully closes out their debut album with an almost-acapella cover of Gillian Welch’s unreleased “Hundred Miles,” that is pure magic. Between the unity of breath and the butter-like quality of these interchanging voices, this track feels as if the group is right in the room. In See You Around, I’m With Her has mastered a deep respect for the tradition of folk, while simultaneously breaking boundaries in a stunning and powerful way. The album moves at the speed it needs to, reflecting on the past and pushing forward to better days. This supergroup has set the bar extremely high for themselves and we can only hope that we do, in fact, see them around soon.